The Wall Street Journal had an editorial last week suggesting that the US air traffic control system needs to privatize. It’s not a new debate, and though I will get into some specifics of the discussion below, what really resonated for me is how religious and ideological is the belief that corporations just do everything better. It’s not like the WSJ made any attempt whatsoever to list (and even dismiss) counter-arguments to ATC privatization. It’s almost as if the notion that there could be some justification for a publicly funded and run ATC has just never occurred to them. It reminded me of a similar discussion, in a post in an energy blog I respect, lamenting the “dysfunction” in California’s energy politics, particularly from the CPUC. What both pieces seemed to have in common is a definition of dysfunction that hews very close to “not the outcome that a market would have produced.” That is to say, they see the output of non-market (that is, political) processes as fundamentally inferior and inefficient, if not outright illegitimate. Of course, the outcomes from political processes can be inefficient and dysfunctional, but this is hardly a law of nature. For my loyal reader (sadly, not a typo), none of this is news, but it still saddens me that so many potentially interesting problems (like how best to provision air traffic control services) break down on such tired ideological grounds: do you want to make policy based on one-interested-dollar per vote or one-interested-person per vote? I want us to be much more agnostic and much more empirical in these kinds of debates. Sometimes markets get good/bad outcomes, sometimes politics does. For example, you might never have noticed that you can’t fly Lufthansa or Ryanair from San Francisco to Chicago. That’s because there are “cabotage” laws in the US that bar foreign carriers from offering service between US cities. Those laws are blatantly anti-competitive and the flying public is definitely harmed by this. This is a political outcome I don’t particularly like due, in part, to Congress paying better attention to the airlines than to the passengers. Yet, I’m not quite ready to suggest that politics does not belong in aviation. Or, in terms of energy regulation, it’s worth remembering that we brought politics into the equation a very long time ago because “the market” was generating pretty crappy outcomes, too. What I’m saying is that neither approach has a exclusive rights to dysfunction. OK. Let’s get back to ATC and the WSJ piece. Here’s another interesting mental exercise: Imagine you have developed new technology to improve the throughput of an ATC facility by 30% — but the hitch is that when you deploy the technology, there will be diminution in performance during the switchover, as human learning, inevitable hiccups, and the need to temporary run the old and new systems in parallel takes its toll. Now imagine that you want to deploy that technology at a facility that is already operating at near its theoretical maximum capability. See a problem there? It’s not an easy thing. Another issue in the article regards something called ADS-B (Automatic Dependent Surveillance – Broadcast), a system by which aircraft broadcast their GPS-derived position. Sounds pretty good, and yet, the US has taken a long time to get it going widely. (It’s not required on all aircraft until 2020) Why? Well, one reason is that a lot of the potential cost-savings from switching to ADS-B would come from the retirement of expensive, old primary radars that “paint” aircraft with radio waves and sense the reflected energy. Thing is, primary radars can see metal objects in the sky, and ADS-B receivers only see aircraft that are broadcasting their position. You may have heard in recent hijackings how transponders were disabled by pilot — so, though the system is cool, it certainly cannot alone replace the existing surveillance systems. The benefits are not immediate and large, and it leaves some important problems unsolved. Add in the high cost of equippage, and it was an easy target to delay. But is that a sign of dysfunction or good decision-making? All of which is to say that I’m not sure a privately run organization, facing similar constraints, would make radically different decisions than has the FAA. 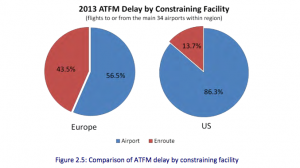 But what happens to privatized ATC if there is a major slowdown in air travel? Do investments stop, or is service degraded due to cost cutting, or does the government end up lending a hand anyway? And how might an airline-fee-based ATC operate differently from one that ostensibly serves the public? Even giving privatization proponents the benefit of the doubt that a privatized ATC would be more efficient and better at cost saving, would such an organization be as good at spending more money when an opportunity comes along to make flying safer, faster, or more convenient for passengers? How about if the costs of such changes fall primarily on the airlines, through direct equippage costs and ATC fees? Or, imagine a scenario where most airlines fly large aircraft between major cities, and an an upstart starts flying lots of small aircraft between small cities. 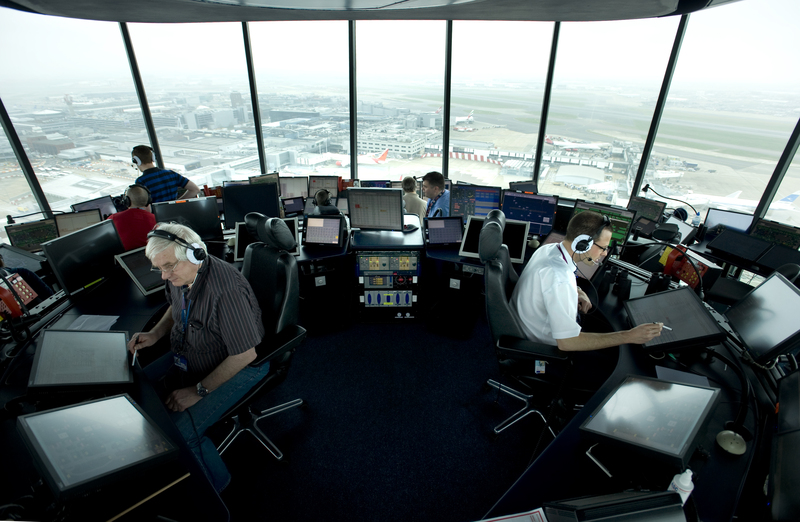 Would a privatized ATC or publicly funded ATC better resist the airlines’ anti-competitive pressures to erect barriers to newcomers? I actually don’t know the answers. The economics of aviation are somewhat mysterious to me, as they probably are to you unless your an economist or operations researcher. But I’m pretty sure the Scott McCartney of the WSJ knows even less. I *am* your loyal reader. I don’t know much about all of this, although I agree with your analysis of the problems with privatization of air traffic control. 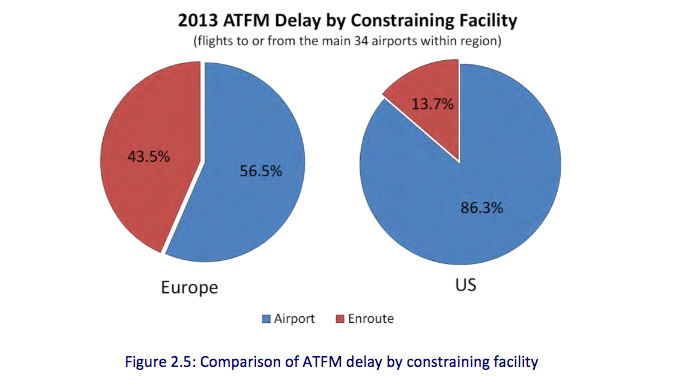 It seems to me that if an increasingly concentrated airline industry paid for ATC with fees, then they would do whatever they could to protect themselves from market entrants, and so you would wind up with some demand for intervention (and also all the problems of a lazy oligopoly). Also, this seems like something we should treat like a public good, rather than something whose use rights are controlled by a club (so, yeah, a club good). Would consumers even benefit from the efficiencies that a privatized system might yield? Count me unenthusiastic. Before I started writing this bit, I thought I was more passionate about this issue than I turned out to be. In actuality, I’m rather ambivalent — though the lobbying organization that is supposed to represent my interests as a private user of the National Airspace System, is absolutely opposed to a fee-based system, private or public. Every proposal so far has had a carve-out by which piston-powered bug-smashers would only pay a small, annual fee for all-you-can-eat access, whereas the per-operations fees would fall on operators of larger aircraft. (In Canada, this annual fee is about $70/user). But the AOPA still hates it because they see it as a camel’s nose sort of thing, plus a way to squeeze business aviation (who would be subject to the same fees as airliners), plus a way to shrink the voice of all the low-paying users of the system. But your point about lazy oligopoly, is, I think, the right point. At a macro level, we have to really assess if there are “national interests” in having the system work in pro-public ways. I think there is. The airspace above our heads is a shared resource, and, though, letting a private organization run it, though not the same as deeding it over, still seems suspect. Also, regarding your point about whether benefits of privatization would accrue to the air traveling public, I would say maybe. For one, ATC just doesn’t cost all that much on a passenger-mile basis, so let’s not even get worked up over those savings. (And compared to Europe, we move more planes in denser space for less money as it is.) Whether a modernized ATC might be more effective and therefore actually somehow make flying itself safer, faster, or more pleasant — I see that as quite a stretch.